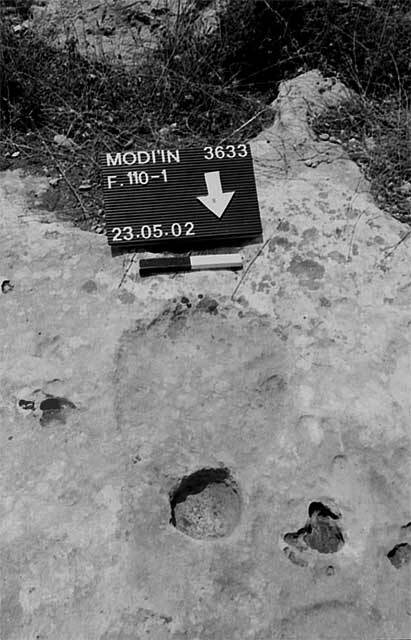 During May–June 2002, a salvage excavation was conducted in Modi‘in, within the precincts of the Khirbat Umm el-‘Umdan and Horbat Hammim sites (Permit No. A-3633; map ref. NIG 1976–98/6433–49; OIG 1476–98/1433–49), prior to the paving of Highway 200. 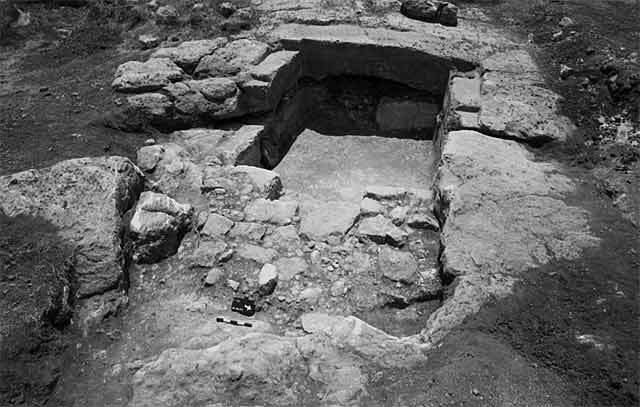 The excavation, undertaken on behalf of the Israel Antiquities Authority and underwritten by the Ministry of Construction and Housing, was directed by E. Kogan-Zahavi, with the assistance of S. Ayyub, R. Avner and E. Aladjem (area supervision), R. Abu Khalaf (administration), A. Hajian and T. Kornfeld (surveying), T. Sagiv (field photography) and I. Lidski (pottery drawing). The route of the road extends from southeast to northwest (length c. 2 km, width c. 10 m; Figs. 1, 2) and passes within the site of Kh. 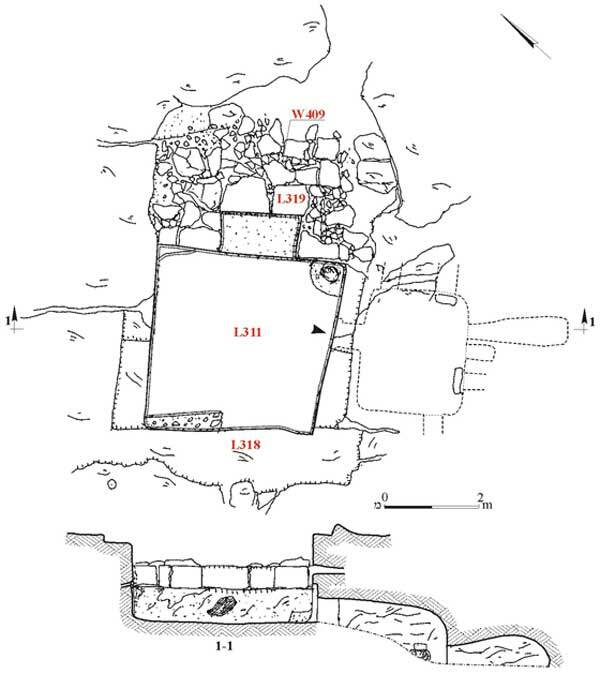 Umm el-‘Umdan, where a settlement from the Second Temple and the Byzantine periods had been excavated (HA-ESI 114:64*–68*; Qadmoniot 130:57–59 [Hebrew]). Agricultural terraces, pens and sections of an ancient road that led to Kh. Umm el-‘Umdan were surveyed and documented and numerous agricultural installations, quarries and burial caves were exposed. The ceramic finds indicate that the agricultural and burial activities at the site should be dated from the time of the Second Temple to the Byzantine period. 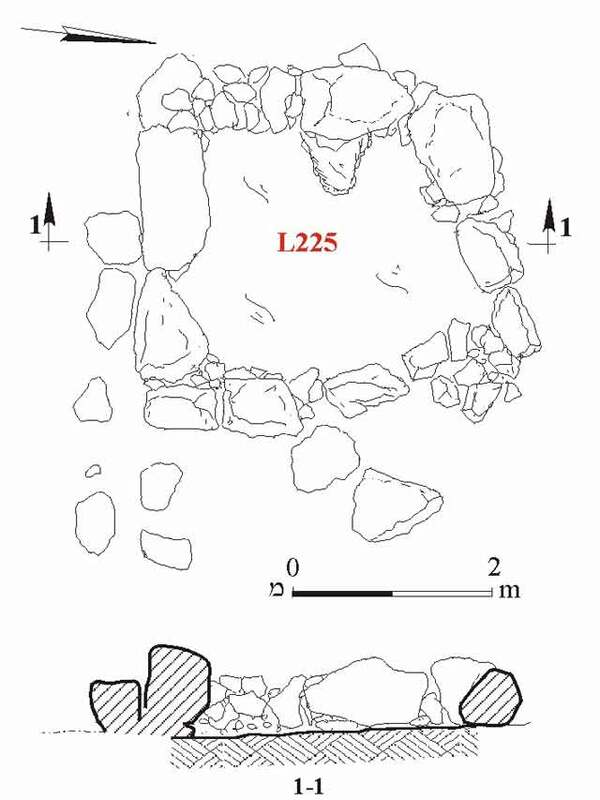 Cave 24, located at the western side of the area, had a rounded shape and a rock-hewn staircase led to its entrance that faced north (Fig. 3). A probe was excavated alongside the entrance and the few potsherds on the floor included a lamp fragment from the Byzantine periods (L104; Fig. 4:1). As the entrance to the cave was wide, it may have been used for dwelling. 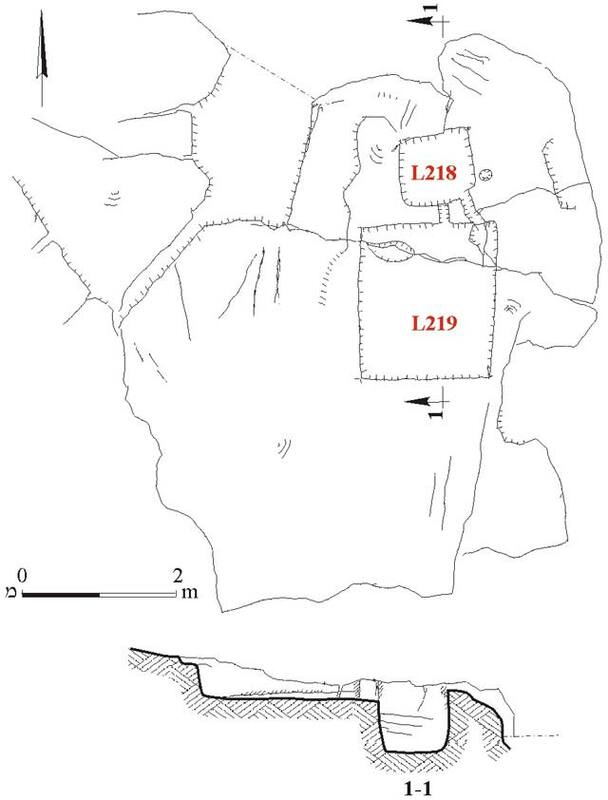 Four caves, identified as burial caves (131, 171–173), were concentrated at the southeastern side of the area, on a hill that overlooked Kh. Umm el-‘Umdan to the east and in whose direction the cave entrances faced. Of these, the impressive Cave 131 (Figs. 5, 6), in whose construction both hewing and building were combined, was partially excavated. Three phases of use were discerned in the cave, which was dated to the Second Temple period. The first phase: The tomb, including a vestibule and a burial chamber, was hewn. The vestibule was square (L311; 3.9 × 3.9 m) and its floor and walls were meticulously dressed and coated with a thick white plaster layer. An entrance (width 1.5 m), as well as built and plastered steps (L319), were incorporated in the eastern facade wall (W409; length 5 m, width 1 m), which was built of ashlar stones and preserved a single course high. The tops of the northern, western and southern sides were leveled as a foundation that was meant to accommodate additional walls, which did not survive (width 0.5 m). The opening to the burial chamber, hewn in the southern side of the vestibule, was found partly sealed with a rolling stone. The burial chamber was not excavated, yet at least five kokhim could be discerned, pointing to a date in the Second Temple period. The second phase. The entrance to the vestibule was blocked with gray bonding material that contained wadi pebbles. The fill in the vestibule contained potsherds, including jars (Fig. 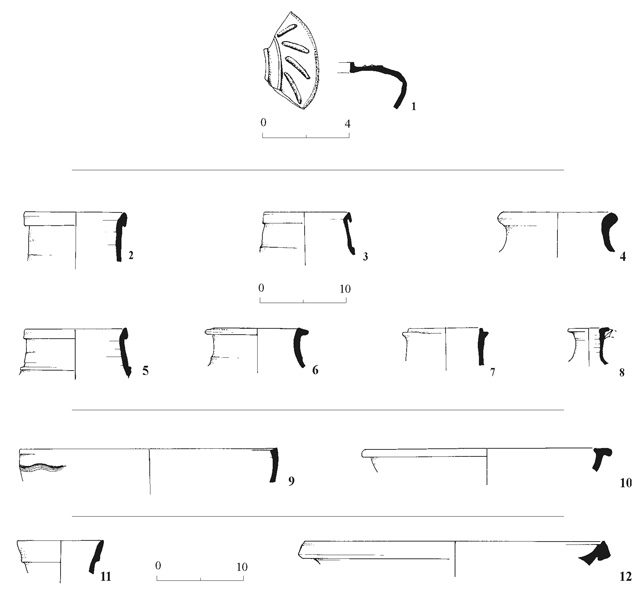 4:2–7) and a jug (Fig. 4:8) from the Early Roman period. The third phase. A terrace was built on the western side of the tomb, which was covered with fill soil that contained fragments of bowls (Fig. 4:9, 10) from the Byzantine period. 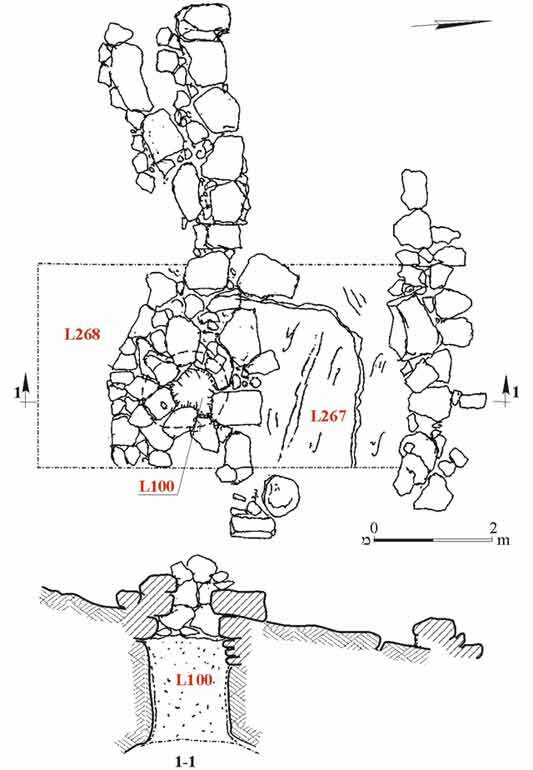 A columbarium, to the east of the burial caves, was partly excavated (130; Fig. 7). An elliptical shaft led to a rounded rock-hewn chamber, in whose sides small round niches were hewn. The southern part of the columbarium had collapsed and hence, only a section of its northern side, which was filled with alluvium, was excavated (L300). The recovered potsherds included a jar rim (Fig. 4:11) from the Hasmonean period, a bowl rim (Fig. 4:12) from the Early Islamic period and body fragments of vessels that could not be dated. A poorly preserved building was exposed west of the columbarium (165; Figs. 8, 9). The fieldstone-built foundation courses, set on bedrock, had survived. 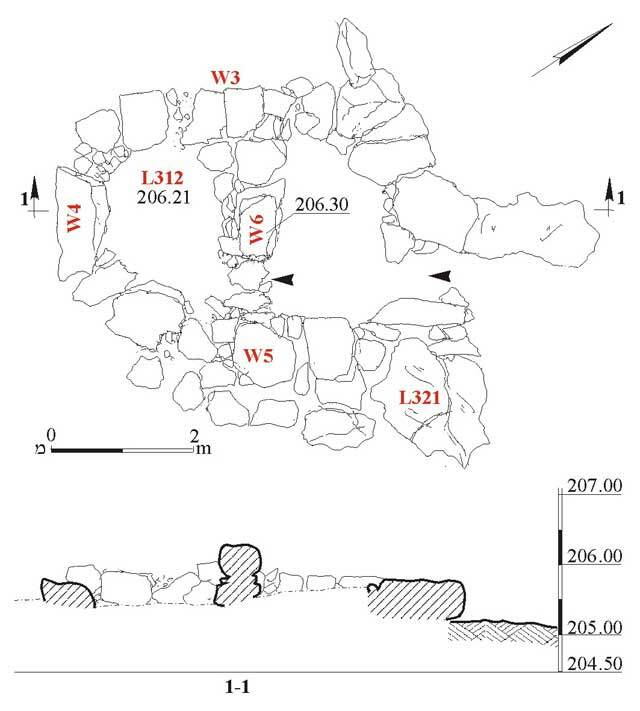 A segment of the eastern wall (W306) and remains of partition walls (W307, W308) that separated among three rooms (A–C) were discerned in the foundations. Bedding of small stones set on bedrock had survived of the building’s floor (Loci 308–310, 316). The potsherds recovered from the bedding consisted of bowls (Fig. 10:1–4), including a Late Roman C bowl (Fig. 10:2) from the end of the sixth–beginning of the seventh centuries CE and jars (Fig. 10:5, 6) from the late Byzantine period. At a later phase, when a terrace that crossed the area from north to south was built (W313), the walls of the building were dismantled and it was covered with soil and pebbles. Watchman Booth 18, in the western side of the area, was survived by the foundation of its northeastern corner (W1, W2; 5 × 7 m; Fig. 11), which was carelessly built of fieldstones and dressed stones. 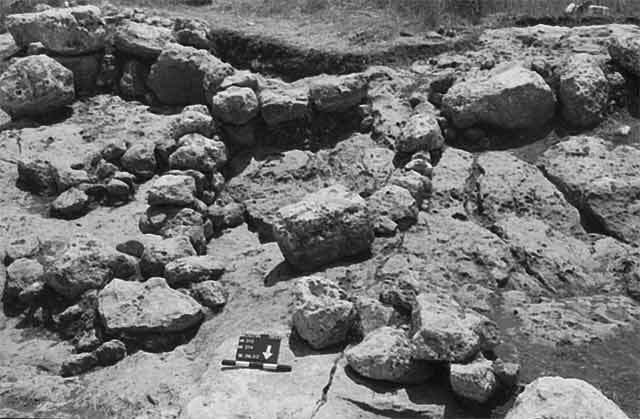 A leveled bedding of small stones (L203), without any datable finds, was preserved of the floor. Watchman Booth 40, in the center of the area, was built of large boulders and carelessly dressed stones; it was preserved a single course high (4.5 × 6.0 m; Fig. 12). The entrance to the booth was on the northeastern side. The watchman booth had two rooms, separated by a partition wall (W6), which was preserved two courses high. A bowl fragment (Fig. 10:7) from the Second Temple period and a jar (Fig. 10:8) from the late Islamic period were discovered on the bedrock floor of the interior room (L312). A square building (46; 4 × 4 m; Fig. 13) was exposed on the hillside, in the center of the area, overlooking an ancient road that led to Kh. Umm el-‘Umdan. The building, founded on a leveled bedrock surface, was preserved three courses high. The bottom course was built of well-dressed stones and the upper courses consisted of large and carelessly dressed stones. The floor bedding (L107), set on bedrock, consisted of soil, stones and pebbles and contained a few ceramic body fragments. It appears that initially, the massive building was a guard tower alongside the road. After its collapse, it was renovated as a watchman booth at a later stage. In the absence of datable finds from the floor bedding, the first phase of this structure was dated to the Roman period, based on its construction style and the second phase was attributed to the Byzantine period, based on its use. The opening of a cave, alongside the southern wall of the tower, was sealed with stones. Five rock-hewn steps (Fig. 14), the top two—broad and the lower three—narrower, led to the cave, whose shape and dimensions are unknown as it was not excavated. 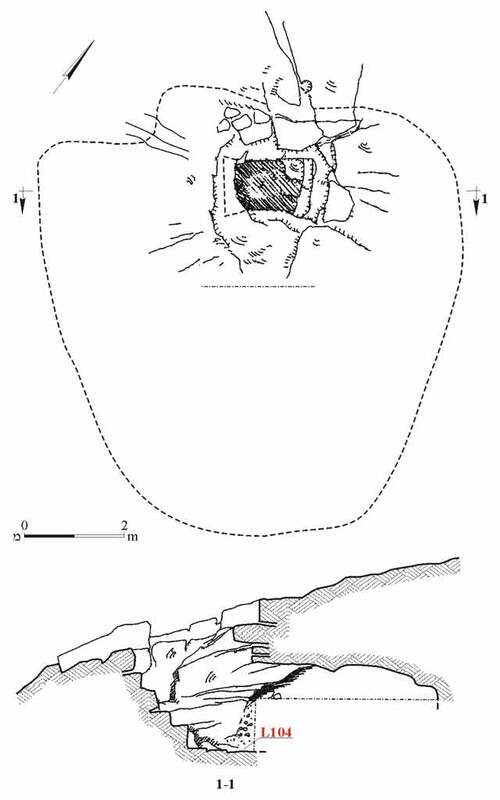 The fill in the cave’s entrance (L108) contained worn potsherds and the rim of a jar from the Early Roman period (Fig. 10:9). It seems that the cave was in use together with the first phase of the building and it was blocked during the building’s second phase. A square building (59; 4.7 × 4.7 m; Fig. 15), constructed from large, carelessly dressed stones, was exposed in the southern end of the area. The accumulated alluvium inside the structure (L225) contained worn potsherds from the Early Roman and Byzantine periods. The building, surrounded on all sides by terraces, was probably used as a field tower. 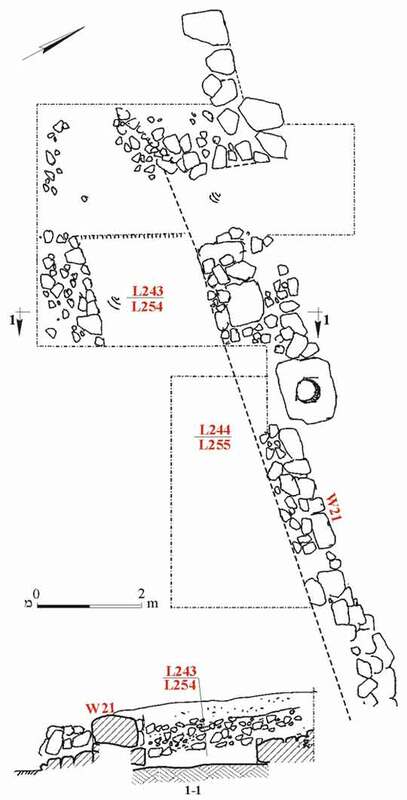 At the bottom of the hill’s slope in the eastern part of the area, a rock-hewn winepress (110; Fig. 16) was exposed. 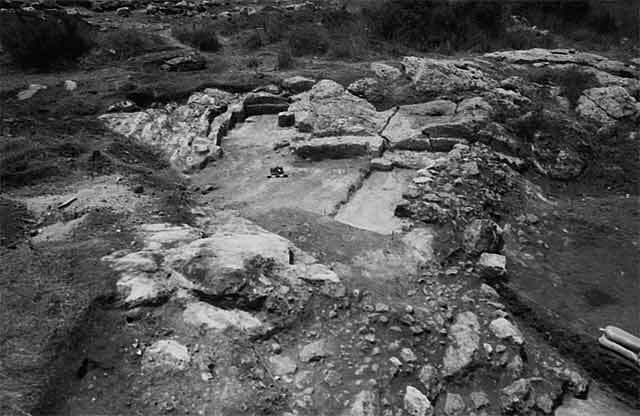 It had a rectangular treading floor (L219; 1.7 × 2.0 m), which was connected to a square collecting vat (L218; 0.9 × 0.9, depth 0.8 m) by way of two hewn channels. A few worn body sherds and a bowl rim from the Byzantine period (Fig. 17:1) were found in the winepress. A hewn pressing installation, which included an elliptical surface (0.18 × 0.20 m; Fig. 18) and a circular pit (diam. 8 cm, depth 10 cm), was discovered near the winepress. A rock-hewn basin (109; diam. 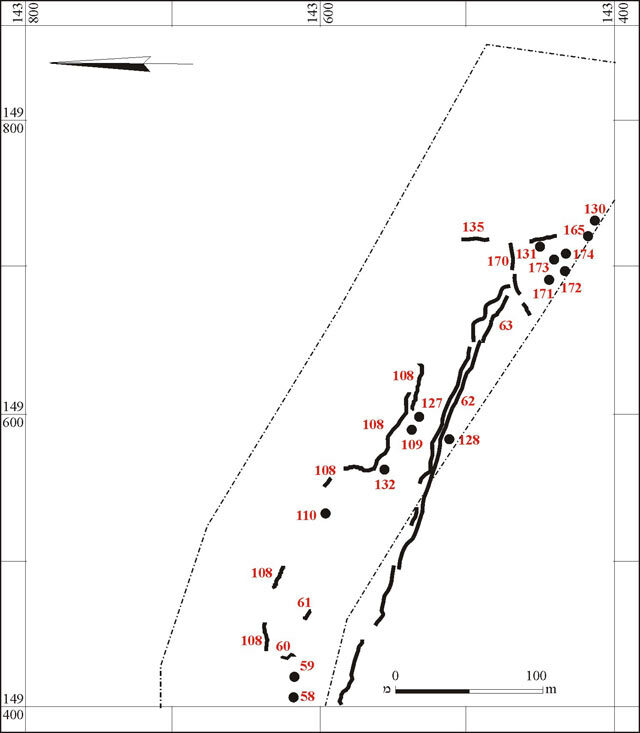 c. 0.8 m, depth c. 0.1 m) was recorded south of the winepress and a cupmark (132; diam. 0.3 m, depth 0.2 m) was discerned to its west. Sections of the ancient road, which began at Khirbat Umm el-‘Umdan and extended in an east–west direction to a point where it changed its course northward near Tower 46, was documented with the aid of GPS. 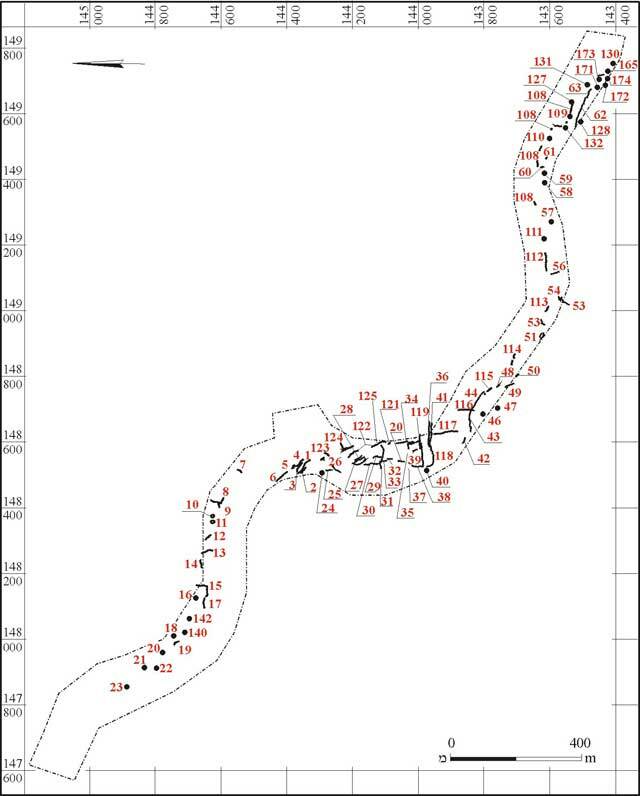 Two road segments were investigated in the east of the area; one was in the east (63; Fig. 19) and the second, somewhat to its west (62; Fig. 20). The width of the road in the two segments was c. 2 m and it was bound by curbs that consisted of large, carelessly dressed stones (Fig. 21). 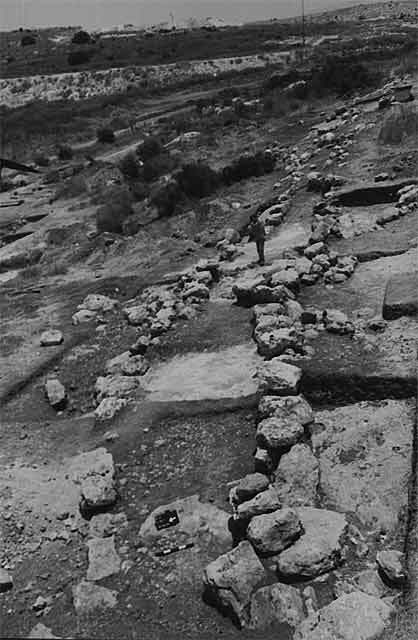 The road pavement was composed of limestone fragments and small stones (Loci 251, 252), overlaying a leveled bedding of stones and soil (Loci 248, 259). A rock-hewn cistern (128), exposed along the southern side of the Road 62, was surrounded by leveled bedrock. The cistern’s opening (diam. 0.78 m) was built of dressed stones that were placed above a hewn shaft (L100; depth 1.8 m), leading into a bell-shaped cistern. The road’s southern curb was incorporated in the wall that was constructed around the cistern’s opening; hence, it seems that the cistern predated the road. The pavement of the eastern segment (L252) contained fragments of bowls from the Byzantine period, including a Late Roman C type bowl (Fig. 17:2) from the middle of the sixth century CE and a base of such a bowl that bore a stamp (Fig. 17:3), for which no comparisons were found. Within the road bedding and above bedrock were potsherds from the Early Roman period, including a krater (Fig. 17:4), a cooking pot (Fig. 17:5) and jars (Fig. 17:6–8). Potsherds in the foundation of the curb around the cistern’s opening included a krater (Fig. 17:9), a cooking pot (Fig. 17:10), a jar (Fig. 17:11) and a jug (Fig. 17:12), dating to the Early Roman period. A quarry (127; 8 × 10 m; Loci 220, 228, 232; Figs. 22, 23) was exposed north of the road in the east part of the area. A terrace wall (W21) was built over part of it. 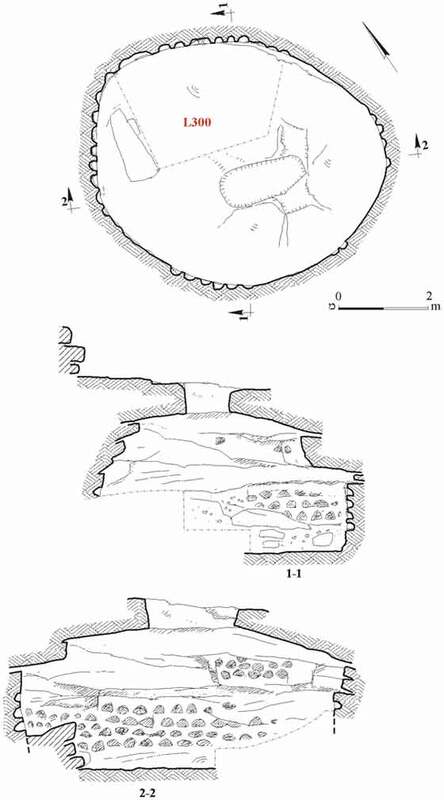 The potsherds on the floor of the quarry included bowls (Fig. 24:1, 2) and jars (Fig. 24:3–5) from the Early Roman period. 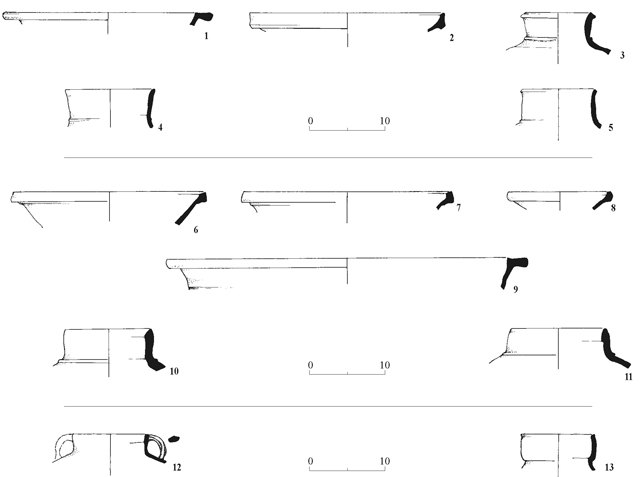 Sections of a massive wall (108; W21; length over 50 m, width 1.0–1.8 m; Fig. 25) that was oriented east–west extended along the lower slopes of the hill. The wall whose exterior face was built of large, dressed stones and its interior face consisted of fieldstones, was preserved three courses high. Its eastern side was founded on leveled bedrock, whereas its western side was set on Quarry 127. 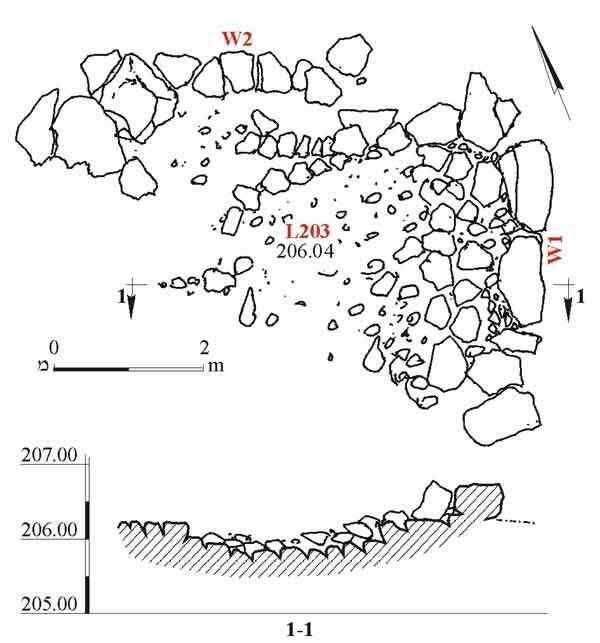 The fill abutting W21 on the north (Loci 243, 244) contained various potsherds, including three Late Roman C bowls, Fig. 24:6 dated to the latter sixth–beginning of seventh centuries CE and Fig. 24:7, 8 dated to the second quarter of the sixth century CE, as well as another bowl (Fig. 24:9) and jar fragments (Fig. 24:10, 11), dating to the Byzantine period. It seems that W21 was intended to delimit the cultivation plot to its south and prevent its flooding by the wadi to its north. The wall, which was partially built over Quarry 127, postdated it and apparently, was not constructed prior to the Byzantine period. 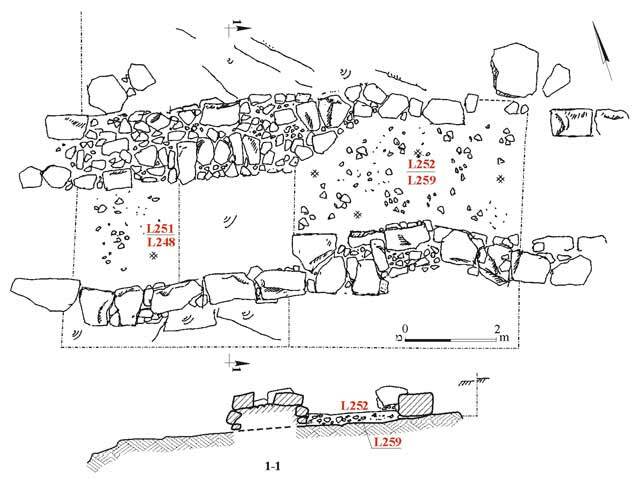 Two terrace walls, oriented north–south were exposed c. 0.5 m below surface in an area (135; Fig. 26) that was cleaned by a backhoe at the eastern end of the excavation, c. 20 m north of the projected highway and c. 100 m west of Umm el-‘Umdan, where a wadi runs through. 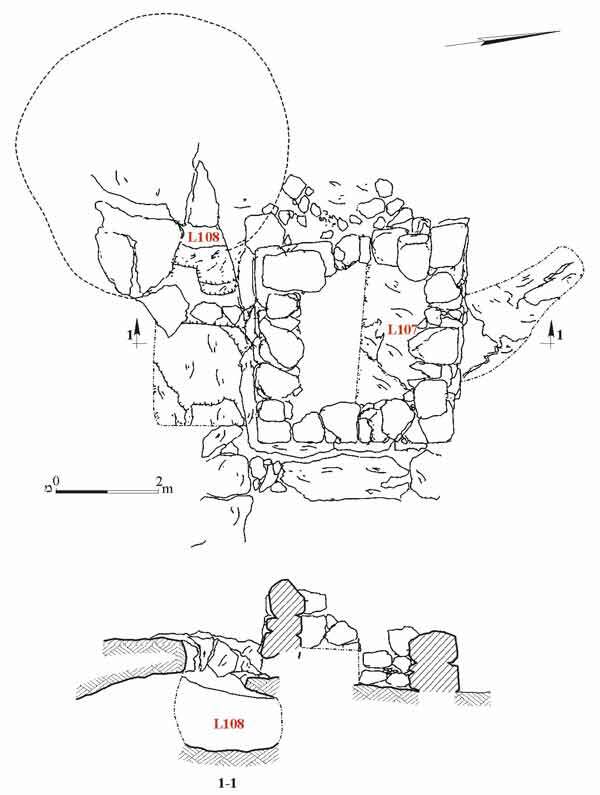 The potsherds in fill adjacent to the walls included a cooking pot (Fig. 24:12) and a jar (Fig. 24:13), dating to the Second Temple period. Many other terrace walls, some visible and others covered with alluvium, were dispersed in the area. 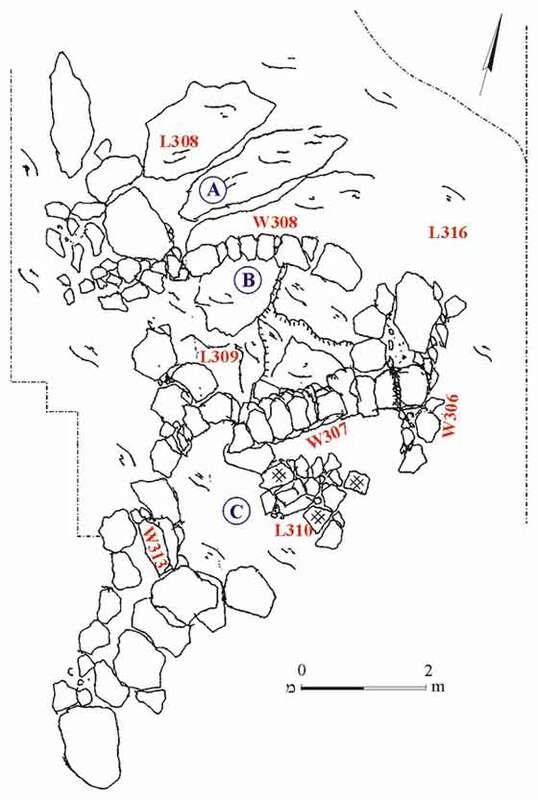 Enclosures (10, 11) surrounded by a circle of boulders and devoid of any datable finds were identified in the western part of the area. These were apparently animal pens. The sites excavated along the route of the road evince that the region, located near Kh. Umm el-‘Umdan and linked to it by the road, functioned as the economic hinterland of the settlement during the Second Temple period and later, during the Byzantine period. It is apparent from the construction of the installations that they were adapted to the various landscape units. Thus, rocky slopes were used for installing a columbarium, winepresses, quarries, watchman booths, animal pens and tombs, whereas on the hilltops near the wadi, farming terraces were discovered. It is feasible to partially reconstruct the area’s function during the two periods of use, in spite of its close proximity to surface, the scarcity of datable finds and their mixed nature that made it difficult to date the installations. The tombs, which were in all likelihood part of the settlement’s cemetery, as well as the road that linked the two, the quarry, the cistern and the columbarium, can be ascribed to the Second Temple period. The winepress could not be dated, although this type of installation is known in the region during the Second Temple period. 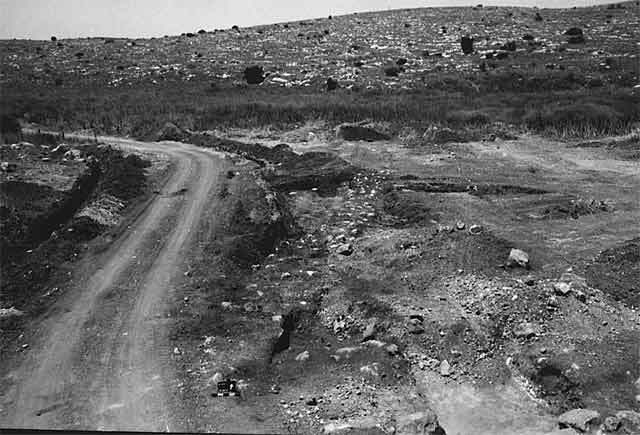 Part of the road continued to be used during the Byzantine period and the agricultural area was enlarged with the construction of numerous farming terraces, fences and watchman booths, some of which negated the quarry and the columbarium, a segment of the road and even part of the cemetery. 1. Map of the sites. 3. 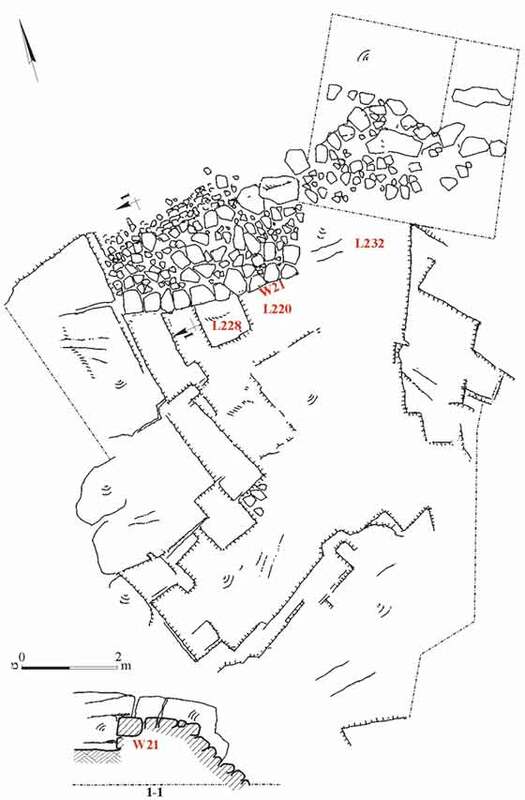 Cave 24, plan and section. 4. Pottery (24, 131, 130). 5. 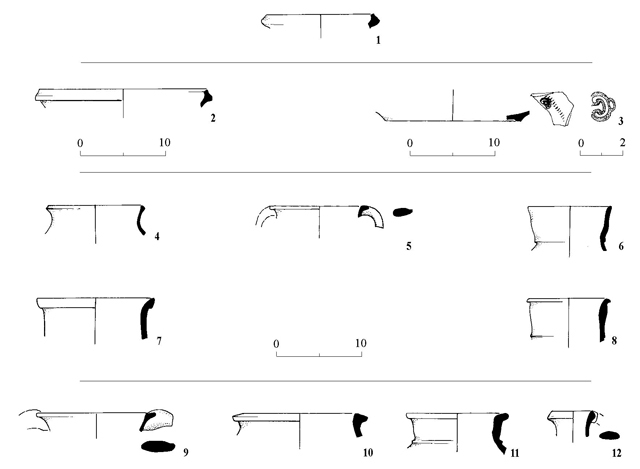 Burial Cave 131, plan and section. 6. 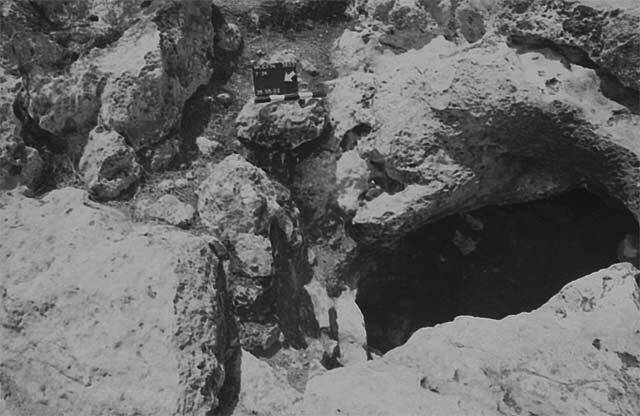 Cave 131, looking north. 7. Columbarium 130, plan and sections. 9. Building 165, looking south. 10. Pottery (165, 40, 46). 11. Watchman Booth 18, plan and section. 12. Watchman Booth 40, plan and section. 13. Field Tower 46, plan and section. 14. Field Tower 46, looking east. 15. Field Tower 59, plan and section. 16. Winepress 110, plan and section. 17. Pottery (110, 62, 63). 18. Pressing installation, looking south. 19. Road 63, plan and section. 20. Road 62 and Cistern 128, plan and section. 21. Ancient road, general view to the west. 22. Quarry 127, plan and section. 23. Quarry 127, looking south. 24. Pottery (127, 108, 135). 25. 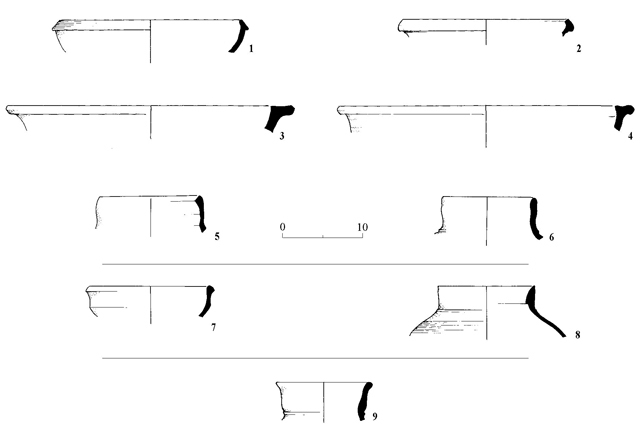 Terrace wall 108, plan and section. 26. Terraces in Area 135, looking west.